Educate International Inc. partners with local schools in the U.S. and in developing countries and provides assistance with funds raised through special events, corporate and church sponsorship, and individual gifts. 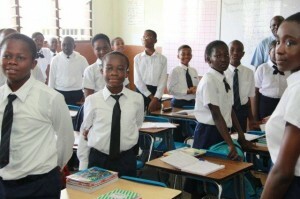 Vernon’s work with Educate International has provided desks, chairs, computers and other supplies to schools like Oasis Christian Academy in Ghana. Attached is a picture from Vernon’s most recent trip to the Academy in October 2013.